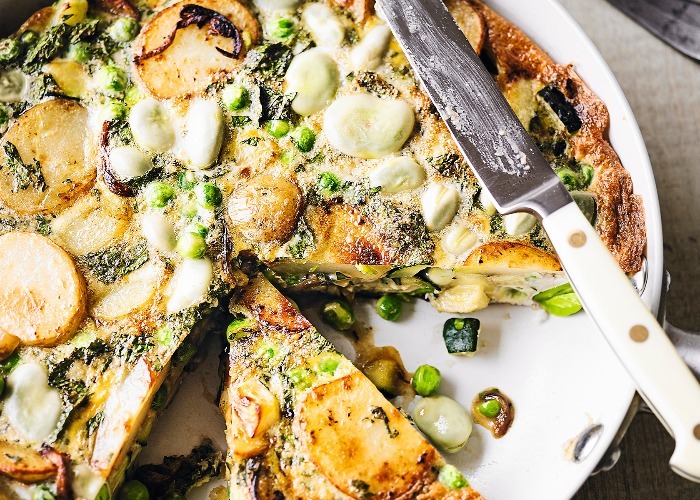 This Spanish tortilla is a great way of sneaking more veg into a meal and will be an instant hit at lunch. You could also serve it for a heartier breakfast or at a brunch with a light green salad on the side. Heat half the oil in a large frying pan over a medium heat. Add the potatoes and onion, and season. Cook for 15 minutes, turning occasionally until tender. Add the cubed courgette (zucchini) to the pan, increase the heat and cook for a further 3–5 minutes until the potatoes are golden. Meanwhile, cook the peas and broad beans in a pan of boiling water for 1 minute until just tender. Drain then add to the golden potatoes. Cook for a further couple of minutes. Place the eggs, mint and seasoning in a large bowl, and beat lightly with a fork. Add the hot vegetables from the pan and mix thoroughly. Leave to stand for 5 minutes. Warm the remaining oil in a 20cm (8in) non-stick frying pan over a medium heat until very hot. Pour in the egg mixture, stir with a fork, lifting the middle of the tortilla to let the runny egg down into the base. Cook for 4–5 minutes until set and the base is golden. Invert onto a plate, then slide back into the pan and cook for another 2–3 minutes, until thoroughly cooked and golden. Serve warm or at room temperature with salad.